What makes Apple tick? How is it that it came back from the dead to surpass both Google and Microsoft in market cap? French consulting firm faberNovel takes a stab at explaining Apple’s success and its strategy against its two main rivals in the SlideShare above. (In the past, faberNovel has created similar slideshows about Google). The 48-slide presentation, titles “Apple: 8 Easy Steps To Beat Microsoft (And Google),” boils Apple’s strategy down to eight steps including “the arrogance of simplicity” (Step 1) to customer lock-in (Step 3), selling at a premium (Step 4), cross-selling products (Step 5), and, of course, think different (Step 7). Much of this is not new information, but seeing it all in a detailed slide presentation helps put Apple’s various moves in context. Apple starts by stripping away complexity from computing products, paring down features in favor of making their products more effortless to master. Apple locks in customers by controlling every aspect of a product through vertical integration. For instance, it doesn’t make much money from iTunes, but that is how it keeps customers coming back. It makes its money from hardware, which it sells at a premium. It has been able to increase its gross margins from 23 percent in 2001 to 40 percent last year. Over that time period, it went from a niche, high-end computer maker to a consumer electronics company. 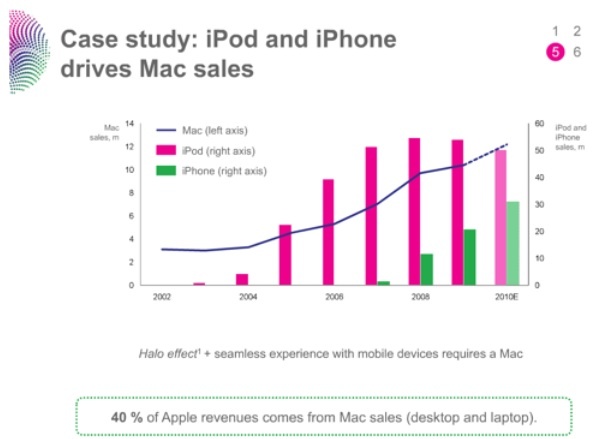 But its iPods, iPhones, and iPads bring new consumers into the Mac fold and drive sales of Mac computers, which of course work better with all of its other devices. The iPod, iPhone, and now the iPad are what drive mainstream adoption for Apple and have propelled it to become the powerhouse it is today. 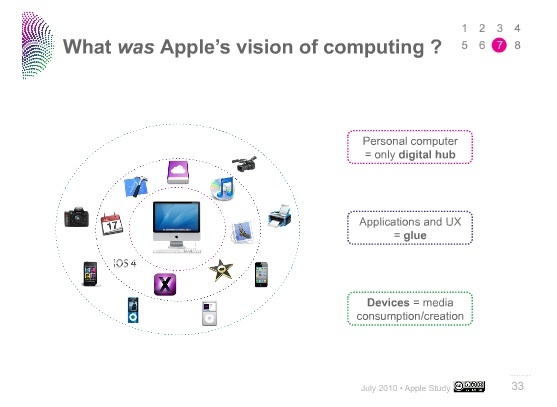 The part of the presentation which is the most insightful is when it illustrates the thinking behind Apple’s emerging cloud strategy. While iTunes in the cloud is a foregone conclusion, that might just be the first wisp of an entirely new product strategy. 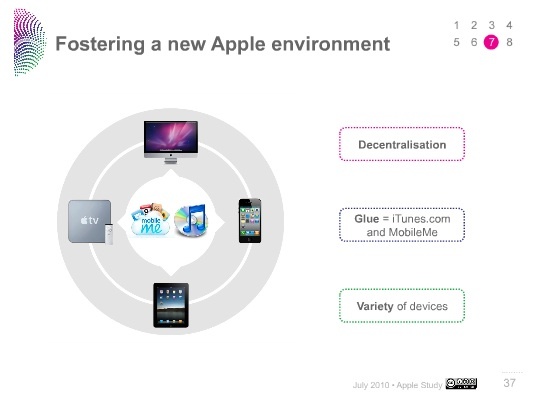 When Apple started to make other devices such as the iPod, iPhone, and Apple TV, they were designed to connect to the Mac as the digital hub syncing and managing all of these devices and others like digital cameras. These began as media creation and consumption devices, but then evolved into communications devices in their own right. Applications were the glue that connected these devices to the computer hub. But now we are entering the post-PC era with the iPhone and the iPad, depending on the Mac as a central, orchestrating digital hub no longer makes any sense. iPhones and iPads are powerful computers in their own right. The new hub is the cloud, which can manage many more devices and offer much more powerful computing experiences (“speech recognition, unlimited storage”) than any personal computer. Google is already all about the cloud. Microsoft is moving in that direction, and so will Apple. The new glue tying its devices to the cloud will be iTunes and MobileMe, which faberNovel predicts Apple will make free because of its strategic potential to lock customers into the Apple universe. Instead of syncing your devices to your computer, MobileMe syncs them to the cloud. And why store all of your songs and movies on your computer, when you can stream them from iTunes in the cloud? (That is why Apple bought Lala). There is unlimited storage, it is all in one place accessible from any device, and Apple can start charging subscription fees for streaming music and movies. Throw your photos up there too as an extra backup while you are at it.